This soup is beautiful, refreshing and easy to throw together on a weeknight. 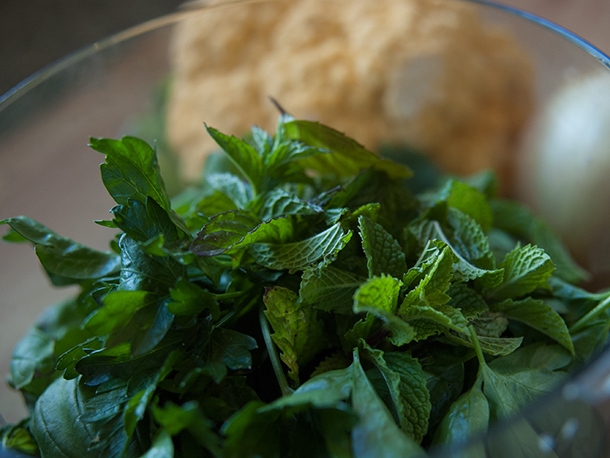 It reminds me so much of spring--the trick is making a pesto and adding it to the soup as it is finishing up. I jokingly commented after it was made that it looks just like broccoli soup because of the amount of herbs in it, and I think broccoli would be a great substitute for the cauliflower. To begin, preheat the oven to 350 degrees and roughly chop the cauliflower into equally sized pieces. The variety of cauliflower I used is called Cheddar and is a beautiful pale orange color, but any type of cauliflower will do just fine. Yellow cauliflower was introduced in the early part of this century along with purple and green cauliflower, none of which taste drastically different from their white parent, but add a bright hue to most dishes. Transfer the cauliflower to a sheet pan, drizzle with olive oil and heavily sprinkle with salt and pepper. Let that roast about 15 minutes until the cauliflower has become soft and starts to release some liquid. While that is cooking, make the pesto that is going to be the herb-filled addition to this soup. 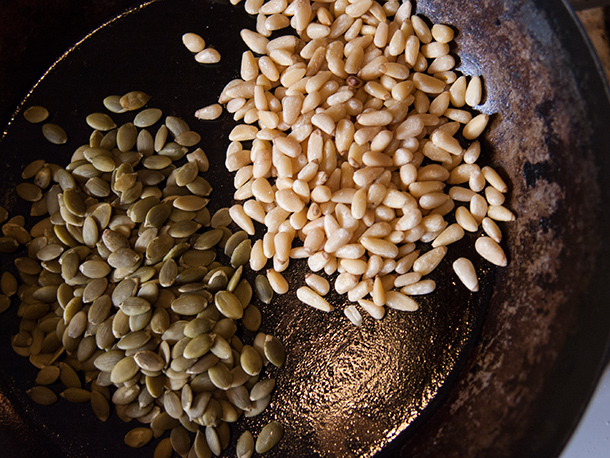 Lightly toast the pine nuts and pepitas in a dry pan over medium high heat, stirring constantly. They should only cook for 2-3 minutes, just until you can smell the pine nuts and they start to brown slightly. This is going to add a delicious nutty flavor to the pesto. Combine the nuts, herbs, 2 tablespoons lemon juice, 1/4 cup olive oil and 1-2 tablespoons kosher salt in a food processor and pulse until smooth. Add more olive oil and salt as needed. In a stock pot, cook diced onions on medium heat until soft and translucent. Add stock and bring to a simmer. Toss in the cauliflower and most of the pesto (I saved about 1/4 of it to use as a topping to the soup) and blend until smooth. Let it simmer for a few minutes and it is ready to rock. 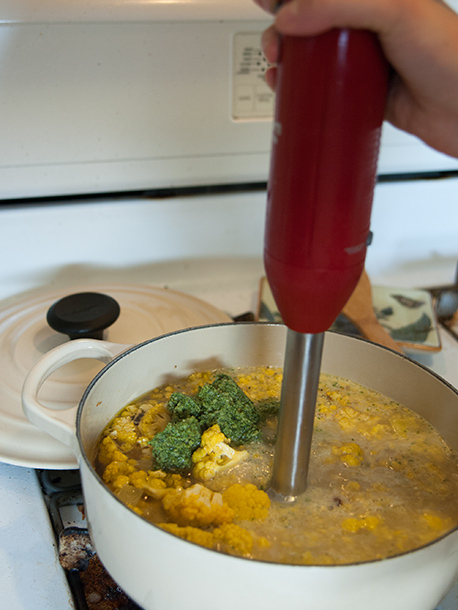 Combine the rest of the pesto you saved with a bit more olive oil and use it to garnish the finished soup. This pesto is also delicious on its own and you can really substitute whichever nuts you have in the kitchen- I think walnuts are pretty killer in it as well. Hope you enjoy!